If you have not already noticed, I have an affection for games. I honestly cannot get enough of them and I can only hope that you all like them too! My newest game in my expanding arsenal is called ThreadBound. 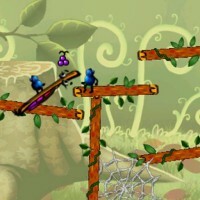 It is labeled as the first true iPhone platformer and I tend to agree. 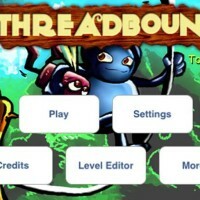 ThreadBound brings to the iPhone games universe a fun control scheme, a ton of levels, good sounds and visuals, and something I have never seen before in an iPhone game, a level editor. In ThreadBound, you play as “Stickler”, who is a stick bug that helps guide the thread bugs to safety. In other words, you move Stickler around the level and angle him in order to ensure that the thread bug does not die. 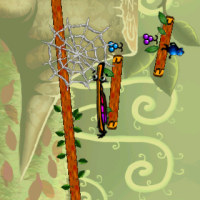 So for example, using Stickler you can position him to be a bridge, a wall, or a ramp, which the thread bug will either walk across, walk into and turn around or walk up or down on. However, this is where the intuitive control scheme comes in. To control Stickler, ThreadBound utilizes multitouch which I found to be extremely amusing. You just take your two thumbs (I used thumbs but you can use your fingers too) and place them both on the screen. From here, you simply move your thumbs/fingers to position Stickler. The game requires a surprising amount of problem solving, especially in the later levels which continually makes the game play fresh. 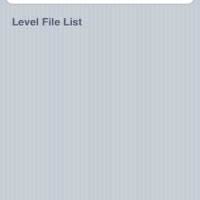 Speaking of which, the game comes with 54 levels. 54! So if not anything else, right there is the fantastic value of this game. Within each level you also get various powerups that will help you overcome additional challenges in getting the thread bug to safety. Moreover, ThreadBound includes a feature that you all know I love; you get to listen to your own music during game play. I think every single game should have this option because sometimes, you just want to listen to your own stuff! ThreadBound, well done! Overall, I very much enjoy ThreadBound. I get a great control scheme, solid sounds and visuals, more levels than I could ever complete, and a level editor. Plus my favorite feature of being able to listen to my own music! I will giveaway one copy of ThreadBound today! To get it, just leave a meaningful comment below about the app! A winner will be chosen at random and the contest ends today at 11:59PM. You can check out ThreadBound in the iTunes AppStore for $0.99! UltraSn0w: Unlock your iPhone 3G on 3.0 Firmware on Friday!